It’s back to football this weekend with the Millers entertaining Derby County at the New York Stadium when Peter Bankes from Merseyside will have the whistle. This is the second time Peter has been in the middle at the New York Stadium this season, the first time being last month when Wigan Athletic were in town for the first round of the Carabao Cup. Rotherham won the game three-one with two goals from Jamie Proctor and another from Semi Ajayi with James Vaughan replying for the visitors. Wigan’s Alex Bruce was the only booking of the evening. Peter began refereeing at the age of fourteen in his native Liverpool area. Spending two years as a Select Group Assistant Referee, he was appointed to the EFL Referees List in 2014. In December last year Peter was in charge of our game at Bloomfield Road. Blackpool went in front with a goal from Kelvin Mellor but two second half goals from David Ball gave the visitors all three points. Richard Wood, Michael Ihiekwe and Will Vaulks saw yellow for the Millers that afternoon. He had also been in charge of our second round game at Huddersfield Town in the EFL Cup in the August. Despite Semi Ajayi scoring for the Millers in the first minute, Huddersfield scored two in two minutes in the second half (a Phillip Billing penalty and a goal from Joe Lolley) to give the hosts a third round tie away to Crystal Palace. The first time Peter was in charge of a Millers game was in October 2015 for our Friday night game at home to Burnley in front of the TV cameras and the one where caretaker Manager Eric Black was in the dugout. Andre Gray opened the scoring on nine minutes but with fifteen minutes to go a wonder strike from Grant Ward levelled things up. Unfortunately for Rotherham six minutes later Sam Vokes made it two-one to the visitors giving them all three points. The 2016/17 season saw the Millers and Peter meet a few times, the first being in the September when Nottingham Forest were the visitors to the New York Stadium. Jon Taylor put the Millers in front on the half-hour mark but Forest scored twice in the second half from Matt Mills and Apostolos Vellios. In between the visitors goals Mr Bankes gave Darnell Fisher a second yellow card banishing him to the dressing rooms. A goal three minutes from time again from Taylor gave the Millers a point on the night. Also booked that evening was Joe Mattock and Izzy Brown for the hosts plus three Forest players. He was also in charge of our game away at Ashton Gate in February when a goal on seventy-five minutes from Milan Djuric gave Bristol City the three points. 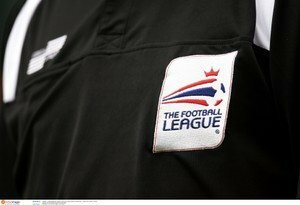 Running the line on Saturday we have Andrew Fox and Billy Smallwood with the Fourth Official being Sebastian Stockbridge from Durham. Peter has been in charge of seven games this season showing thirty yellow cards but no red cards.